I was in the city this past Tuesday to check out “Shop Life,” the latest exhibition at the Tenement Museum. (Details in my next post. Bottom line: totally engaging.) 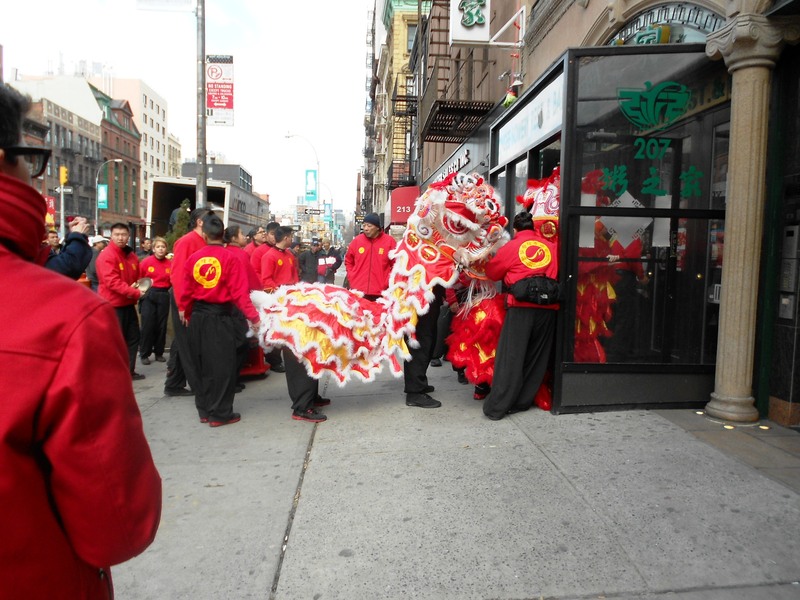 But while walking on my way to lunch, I came upon this Chinese New Year ceremony outside a restaurant. It shows the traditional lion dance – that much I knew. 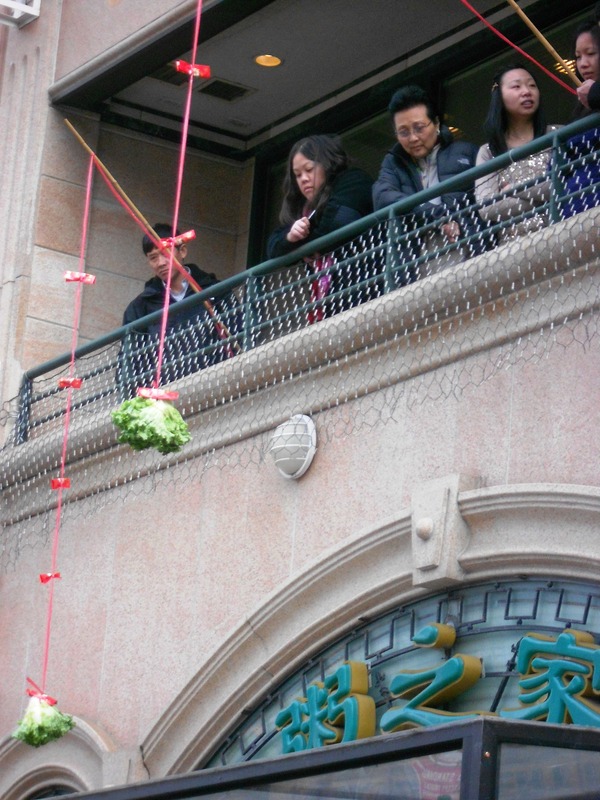 But I had no idea why people were dangling heads of lettuce off the balcony above the entrance. For an explanation of the meaning/symbolism click here. Now onto the items promised in the headline! Have You Discovered the Difference between Supermarket Dried Spices and Fresh-dried Spices? That’s the key to the success of Savory Spice, the Boulder-based company with shops in Westfield and Princeton. Jon Hauge, owner of the Princeton franchise, has been conducting cooking classes that spotlight the difference since before his shop even opened. Here’s what you need to know about his upcoming series, about the almost 600 spices, herbs, and blends that his shop offers, his foolproof recipe for pizza dough, and his myriad recommendations for toppings. 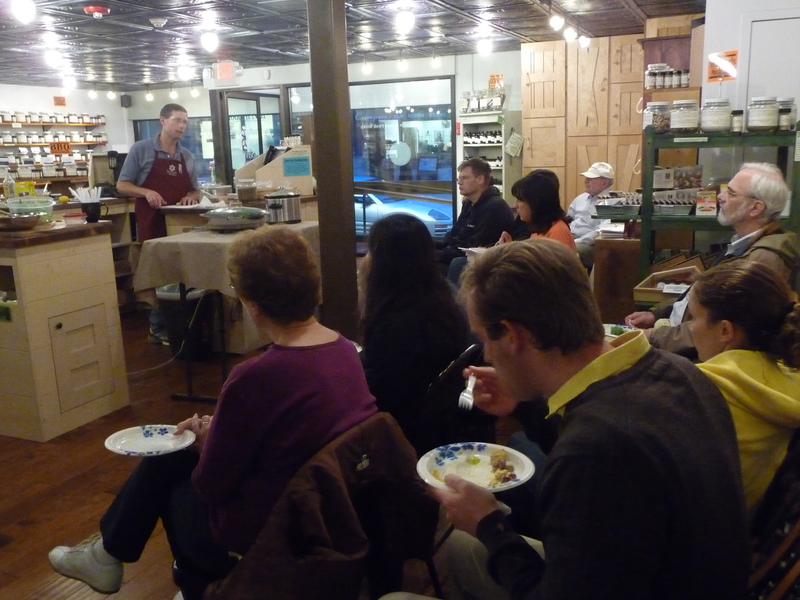 Jon Hauge, owner of Savory Spice on Spring Street in Princeton, was conducting spice-focused classes at the Princeton Adult School even before his shop opened in November of 2011. So his course this coming April, called A World of Spices, will be, Hauge says, either the third or fourth iteration of his popular series. “I typically limit enrollment to fifteen because the classes are held here in the shop,” he explains. The shop’s aromatic 2,400 square feet are filled with nearly 600 fresh-dried herbs, spices, and blends – not to mention extracts, oils, mortar and pestles, salt and pepper mills, spice books, nutmeg grinders, and more. Although each session differs, one class is bound to focus on pizza. “Pizza may sound strange for this, but it’s one of my favorite classes,” he says. “I try to show how easy it is to make pizza dough at home and that, once you have the dough down, the possible spice and herb toppings are endless!” A particular student favorite, he reports, is a cold appetizer pizza topped with goat cheese, arugula, and pomegranate molasses. Savory Spice is at 15 Spring Street, Princeton. 609-454-5627. Jon Hauge’s Spring 2013 class at the Princeton Adult School has filled up since this story was published. For future classes, check out www.princetonadultschool.org. Combine all ingredients in a mixer equipped with a dough hook. Mix until dough pulls away from the sides and adheres to the hook. For a “chewier” texture, continue to mix dough for up to 40 minutes. For a “crispier” crust, increase the oil. To cook the dough: Preheat oven to 400 degrees. Place a pizza stone in oven to preheat for one hour for best results. Allow pizza dough to come to room temperature so it will be easier to work with. To assemble, roll pizza dough to a 13-inch diameter on a floured surface. Remove pizza stone from oven and carefully place dough on top. Lightly cover the bottom of the pizza with the sauce. Bake until crisp and golden, about 20 minutes. Yield: One 13-inch pizza base. Steak Au Poive: Cream together room temperature butter and green peppercorns in brine. Liberally coat steak with the butter mixture. Sear both sides on a very hot cast iron pan being careful not to overcook the steak. Remove from the pan and set aside the steak to cool. Deglaze with your choice of cognac, bourbon, or rum. Add additional peppercorns to taste. Thicken with Wondra flour or corn/arrowroot starch if necessary. Remove from heat. Coat pre-cooked crust with cream cheese. Slice the steak thin and spread over the cream cheese. Top with a light layer of gruyere cheese. Bake until the top cheese melts. Mushrooms with Nutmeg and Vanilla: Slice your choice of fresh mushrooms to a consistent thickness. Feel free to mix dried and fresh if you like. (I use chanterelles and white buttons.) Sauté in a liberal amount of butter until all water is cooked out. (I like cast iron on the grill for this.) Remove from heat and add Vanilla Powder or even extract and either nutmeg or mace or both. Coat pre-cooked crust with shredded mozzarella then layer on the mushroom mix. Cook until cheese is melted. Pomegranate Molasses, Goat Cheese, and Arugula: Coat a pre-cooked crust with goat cheese. Cover with arugula then drizzle on Pomegranate Molasses. Smoky Strawberry: Slice strawberries and macerate for 2 hours. Strain liquid and reduce over low heat to a syrup. Coat a pre-cooked pizza crust with goat cheese and gruyere cheese. Arrange strawberries on top and lightly sprinkle Alderwood Salt and Romano Cheese Powder on top. Cook until cheese melts, then drizzle reduced strawberry glaze over top. Garlic, Pineapple, and Spinach: Sauté garlic and pineapple with butter until golden brown. Add spinach, remove from heat, and cover to let wilt. Place pineapple and spinach evenly over a pre-cooked pizza crust. Top with mozzarella and goat cheese. Cook until cheese is thoroughly melted. Gorgonzola and Asian Pear: Coat pre-cooked crust with goat cheese. Slice Asian pear and arrange on top. Sprinkle with chunked gorgonzola. Cook until cheese melts. You know how sometimes you kick yourself for taking so long to try a restaurant that’s been on your radar or recommended to you by someone you trust? Here are two such examples. Lovin’ Oven: Maybe it was the name that put me off, or maybe that whenever I was in the Stockton/Frenchtown area I chose to get bbq from Mighty Quinn’s at the Stockton Market or a homey meal at Miel’s. Well, Mighty Quinn has decamped (taken over, I have it on good authority, by a former employee who does his old boss proud) and Miel’s has morphed into Lilly’s Meals (no report as yet; it’s by the same Lilly who has Lilly’s on the Canal in Lambertville). So I and a friend recently gave Lovin’ Oven a go for a late breakfast/early lunch. 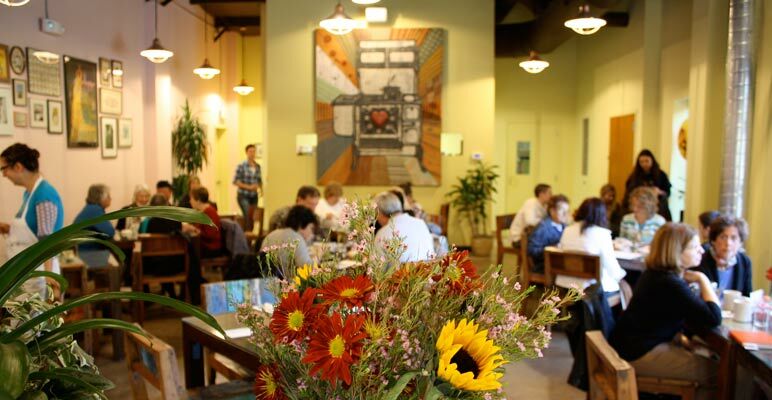 I immediately took to its sincere, colorful, hippie-Zen vibe and decor, its friendly staff, and its breakfast/lunch menu strewn with one temptation after another. I opted for California-style fish tacos ($14) primarily because I rarely encounter good ones ’round these parts. Chunks of very fresh fish (cod?) star in good quality, lightly grilled corn tortillas. Every ingredient is pristine and in the right proportion – avocado, diced fresh veggies, cilantro, and creamy, spicy chipotle sauce. Same with the big, hearty breakfast burrito ($11.50) of flavorful black beans, scrambled eggs, salsa, avocado, and cheese. We finished with good coffee, but didn’t have room for Lovin’ Oven’s highly rated sweets. Next time. In addition to breakfast, lunch, and dinner menus, this charmer offers a cafe menu between lunch and dinner. Jo Sho: Same deal here: why oh why did I wait so long to go? My friend Noriko had touted this unassuming spot in an unassuming strip mall to me months before. This is the kind of place that you don’t come to for the décor – it’s rundown in places and loaded up with Japanese tchotchkes. Service is brisk and a bit brusque – at least until you warm up your servers a bit. Clientele the weekday I was there for lunch was almost exclusively Asian and focused, rightly, on the food. Especially sushi and sashimi so fresh, well-handled, and generously portioned that what appear to be moderate prices become fantastic bargains. (The cooked fare is pretty darn good too.) 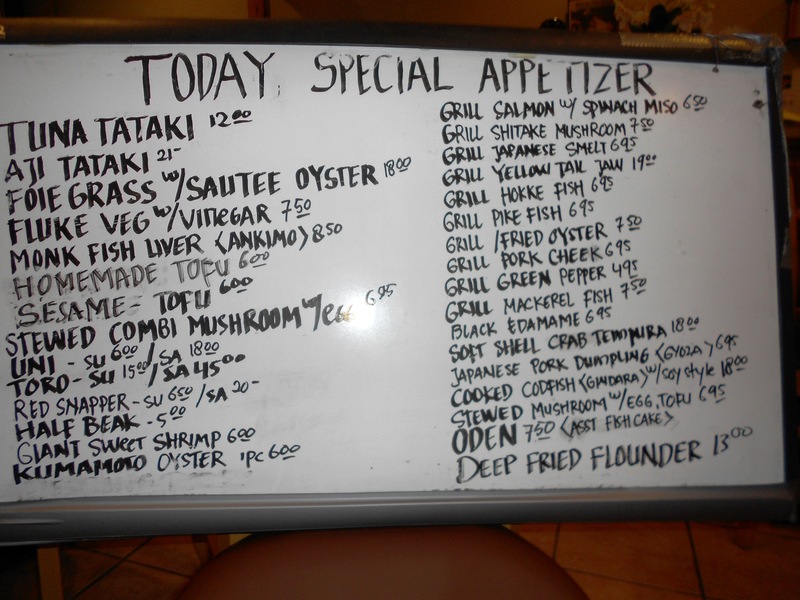 Many lunch specials are offered – just look at the board below! But I came for sushi and, following Noriko’s recommendation, I opted for the chirashi sushi, a big bowl of exceptional sushi rice generously strewn with expertly sliced fish in rainbow colors of white, pink, orange, and rose. The assortment changes daily, I assume, but I enjoyed it all – white tuna and regular tuna, yellow tail, octopus, and shrimp. Rounding out the fish flavors were avocado, wedges of cold omelet, and pickled gourd. All this plus miso soup and a small lettuce salad for $15.50 at lunch and $20 at dinner. We ordered cooked dishes from the specials board. 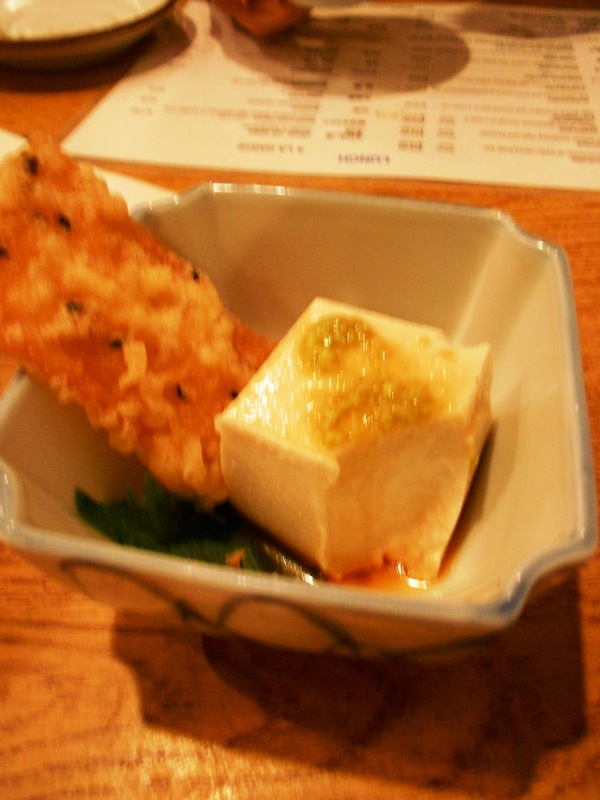 Sesame Tofu is a good-sized square with a wonderfully soft, wet, silky texture. A deep-fried sesame cracker provides textural counterpoint and good-quality wasabi adds punch. “Combi mushrooms” turned out to be a hot bowl of nicely salty broth brimming with a variety of earthy stewed mushrooms, bits of tofu, and a runny boiled egg. Each bite or slurp screams umami. The only misfire was grilled salmon with miso. The portion was generous and the dish included beautifully garnished rice, but the salmon tasted fishy and the creamy miso sauce was grainy. This entry was posted in Favorite Finds, Interviews, Recipes, Restaurants and tagged Chinese New Year, Frenchtown restaurant, Japanese restaurant Somerset, Jo Sho, Jon Hauge, Lambertville restaurant, Lilly's Meals, Lilly's on the Canal, Lion Dance, Lovin' Oven, pizza dough recipe, pizza toppings recipe, Savory Spice, Shop Life exhibition, Stockton Market, Stockton NJ restaurant, Tenement Museum. Bookmark the permalink. Pat FYI We will be serving Cardoon at Enzo’s this weekend and thru the week.